What Is a PATA Cable or Connector? PATA, short for Parallel ATA, is an IDE standard for connecting storage devices like hard drives and optical drives to the motherboard. PATA generally refers to the types of cables and connections that follow this standard. It's important to note that the term Parallel ATA used to simply be called ATA. ATA was retroactively renamed to Parallel ATA when the newer Serial ATA (SATA) standard came into being. Note: Even though PATA and SATA are both IDE standards, PATA (formally ATA) cables and connectors are often referred to simply as IDE cables and connectors. It's not a correct usage but it's very popular nonetheless. 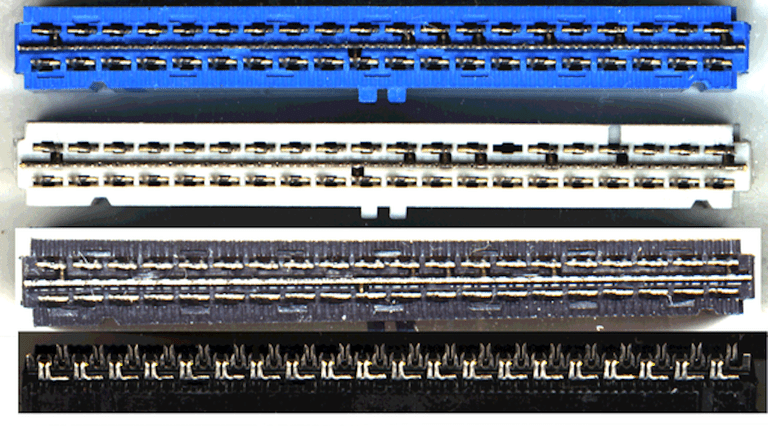 PATA cables are flat cables with 40-pin connectors (in a 20x2 matrix) on either side of the cable. One end of the PATA cable plugs into a port on the motherboard, usually labeled IDE, and the other into the back of a storage device like a hard drive. Some cables have an additional PATA connector midway through the cable for connecting yet another device like a PATA hard drive or an optical disk drive. PATA cables come in 40-wire or 80-wire designs. Newer PATA storage devices require the use of the more capable 80-wire PATA cable to meet certain speed requirements. Both types of PATA cables have 40-pins and look nearly identical, so telling them apart can be difficult. Usually though, the connectors on an 80-wire PATA cable will be black, gray, and blue while the connectors on a 40-wire cable will only be black. ATA-4 drives, or UDMA-33 drives, can transfer data at a maximum rate of 33 MB/s. ATA-6 devices support up to 100 MB/s speeds and might be called PATA/100 drives. The maximum allowable length of a PATA cable is 18 inches (457 mm). Molex is the power connector for PATA hard drives. This connection is what extends out from the power supply for the PATA device to draw power. You might need to use an older PATA device in a newer system that only has SATA cabling. Or, you might need to do the opposite and use a newer SATA device on an older computer that just supports PATA. Maybe you want to connect a PATA hard drive to a computer to run virus scans or back up files. Use a SATA to Molex power connector adapter to use an older PATA device with a power supply that uses 15-pin cable connections. StarTech's SATA to Molex LP4 Power Cable Adapter would work well for this. Use a Molex to SATA adapter to hook up a SATA device with an older power supply that just supports PATA devices with 4-pin power connections. You can use something like this Molex to SATA Female Adapter Cable to make a Molex connector work with a SATA device. Use an IDE to USB adapter to connect a PATA hard drive to a computer through USB. One example of such an adapter is the C2G IDE or Serial ATA Drive Adapter Cable. Since PATA is an older technology, it only makes sense that most of the discussion about PATA and SATA will favor the newer SATA cabling and devices. PATA cables are really big compared to SATA cables. This makes it harder to tie up and manage the cabling when it's laying over other devices in the way. On a similar note, the large PATA cable makes it harder for the computer components to cool down since airflow has to make its way around the bigger cable, something that isn't as much of a problem with slimmer SATA cables. PATA cables are also more expensive than SATA cables because it costs more to manufacture one. This is true even though SATA cables are newer. Another benefit of SATA over PATA is that SATA devices support hot swapping, which means you don't have to shut down the device before you unplug it. If you need to remove a PATA hard drive for whatever reason, it's necessary to actually shut off the entire computer first. One advantage that PATA cables have over SATA cables is that they can have two devices attached to the cable at one time. One is referred to as device 0 (master) and the other device 1 (slave). SATA hard drives just have two connection points - one for the device and the other for the motherboard. Note: One common misconception about using two devices on one cable is that they will both perform only as fast as the slowest device. However, modern ATA adapters support what's called independent device timing, which lets both devices transfer data at their best speed (of course, only up to the speed supported by the cable). PATA devices are supported by really old operating systems like Windows 98 and 95, while SATA devices are not. Also, some SATA devices require a certain device driver in order to fully function. eSATA devices are external SATA devices that can connect to the back of the computer with ease using a SATA cable. PATA cables, however, are only allowed to be 18 inches long, which makes it extremely difficult if not impossible to use a PATA device anywhere but inside the computer case. It's for this reason that external PATA devices use a different technology like USB to bridge the distance.